Even though we’re still getting rubbish like The Forest or The Gallows every now and then, we still stand by our claim that horror is starting to go through a mini-Renaissance, i.e. filmmakers are actually starting to put effort into these films again. So far, it’s given us pleasant surprises like The Babadook and It Follows, and even the ones that aren’t quite up to those standards are still far better thought-out than the average frightfest we get nowadays – ones that fall into the latter are The Hallow, Krampus, and now The Other Side of the Door. Perhaps the most surprising thing about the latest film by Johannes Roberts – who previously directed the Noel Clarke-backed sci-fi horror Storage 24 – is that it’s not as terrible as it so easily could have been. The set-up may sound ridiculous – a grieving mother (The Walking Dead’s Sarah Wayne Callies) who lost her young son in a car accident unknowingly unleashes an evil spirit when she tries to communicate with him from the afterlife – but the execution is for the most part fairly solid. It’s a film that allows itself a slow-burn to establish actual characters, its overall scenario, and the drama that puts later events into motion. You actually get to feel and understand the grief that this family is going through, having lost their son in a tragic accident due to the decisions made by the mother in the heat of the moment; any other film that actively shows something like this and not follow up on it would instantly make the character rather loathsome and negligent, but the fact that they not only do that here and also make it an effective part of the character development really makes it work. Before the horror element even kicks in, it’s like a completely different movie altogether, specifically a domestic drama that showcases a family going through its own depression cycle and handling it in a way that feels believable enough. Again, that would be something of a problem in a film like this, with one portion of the film not fitting well with the rest of it, but it manages to fit together against the odds thanks to some good performances and a deep focus on the pure emotion of the situation. That’s basically a long-winded way of saying that it manages to start out fairly strong… but then the horror genre starts to seep into the cracks. Once it does, it’s a very mixed ride from there on. As is wont with a lot of horror movies looking for cheap scares from its audiences, this film is PACKED with jump-scares, enough that they eventually become more distracting than actually scary after a short while. Every other scene, there will be a sudden thing that will happen accompanied by a painfully loud musical stinger, and it’s such a boring device nowadays that a lot of the scares are unintentionally telegraphed – for example, you know the moment she starts walking down into a deep, dark stairway and into a room covered in cobwebs with only a candle or a match that something is going to suddenly come out of the shadows and give the character and the audience a false alarm, and sure enough it does exactly that. These kind of scares continue throughout the entire movie, whether they’re sudden appearances by fanatical tribesmen who never seem to respect personal space, or one that do not impact the plot in any way shape or form, like at least two that turn out to just be dream sequences, or completely unrelated moments like a run-over body in the middle of the road or a senile person putting their face up to a car window. They’re not even scary, because again they are so clearly telegraphed that you’re just counting down the seconds until the thing you think is going to happen happens, and aside from one or two moments that actually do crawl under your skin it’s very tame next to the much stronger competition. Jump-scare filled though it may be, Roberts still puts more effort into trying to make this an effective experience than something like The Forest; he does let the characters breathe and be actual people facing these dire circumstances, there are underlying themes that do genuinely work at capturing effective drama, and you do get invested enough in these people and the things they’re going through that you want to see how they’re going to solve their problems. But dammit, why did The Other Side of the Door have to follow the restrictive guidelines a little too much? 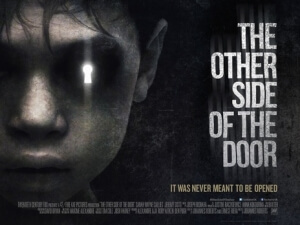 The Other Side of the Door has strong moments throughout that genuinely work, but they’re ultimately let down by a series of ineffective and increasingly frustrating jump-scares that serve no purpose to the overall narrative other than to make itself more of a horror film than it actually is.